If you are unfortunate enough to be tasked with the design and implementation of an IBM PowerVM virtualisation environment for System p and you normally work with vSphere, then this is the post for you. 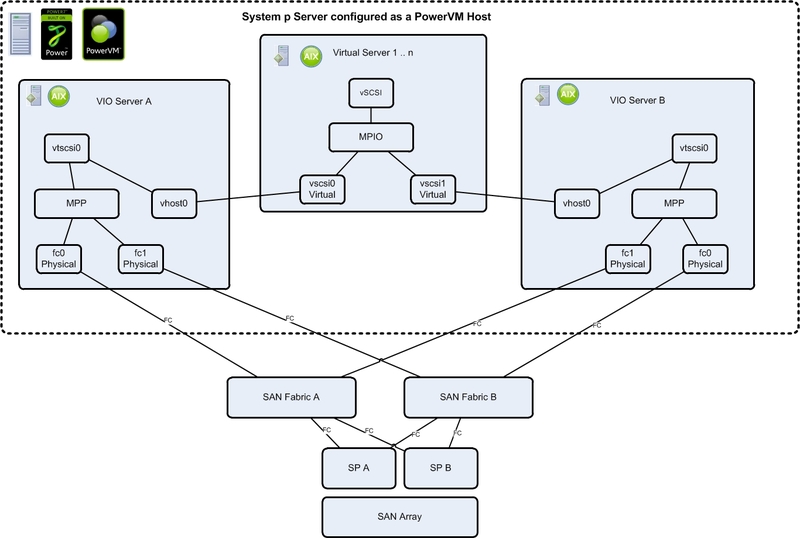 This entry has been written as a high-level overview of PowerVM and provides context via vSphere comparisons. 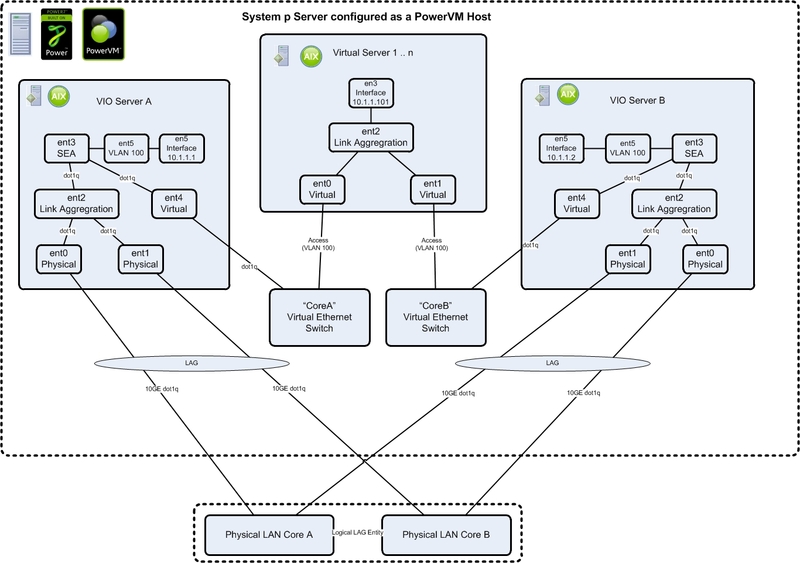 Next to vSphere, PowerVM is convoluted, finicky and difficult to implement. My PowerVM implementation (4 hosts) took four months from start to finish, when an equivalent project with vSphere takes mere days. 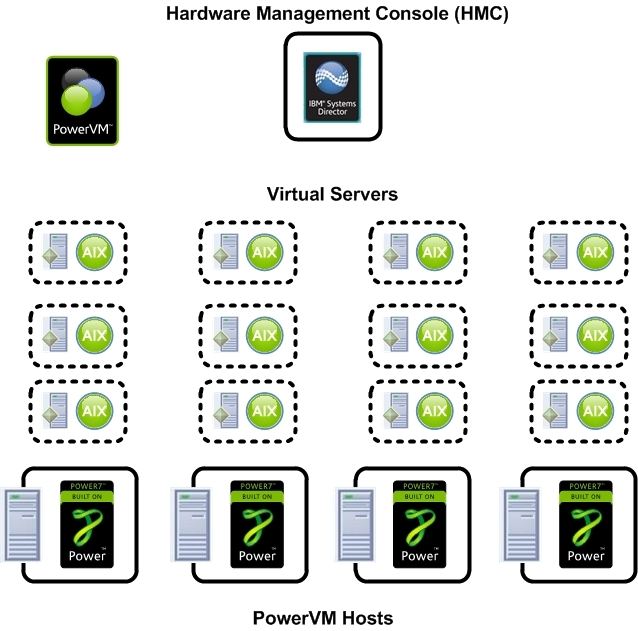 In addition, PowerVM is approximately 8-20 times the cost of a comparable vSphere solution. PowerVM is similar to any other IBM product, where the management interface exposes every single option available and you have to work out which permutation or combination is best for you. However, if you have a Data Center full of physical System p servers (Frame or Blade) then PowerVM will allow you to consolidate and save money by virtualising those workloads. With SystemsDirector and Tivoli, you can achieve automation with advanced operations as well. And once you get it working, it is very stable and reliable. 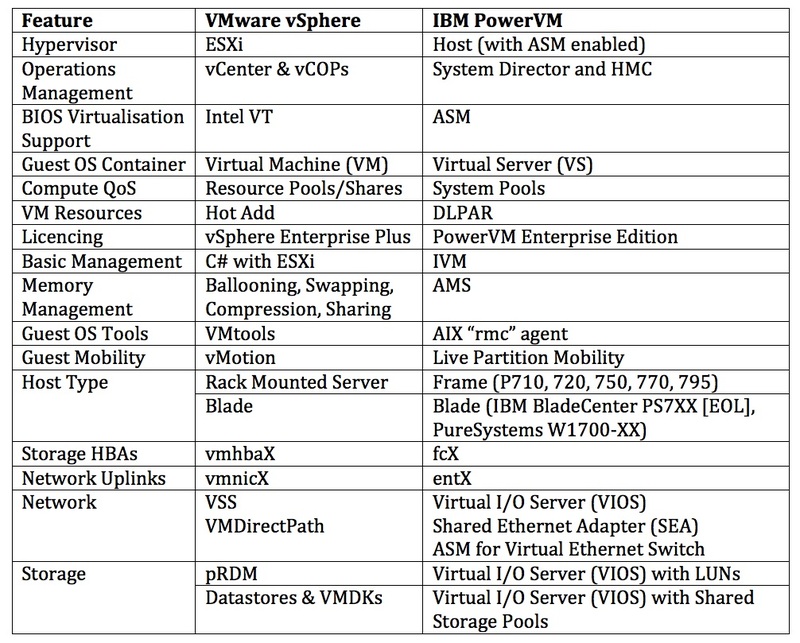 Here is a comparison of vSphere and PowerVM terms. System p servers have an “Advanced Services Module” that provide hypervisor services. System p is capable of running “Linux for Power” in addition to AIX as a Guest Operating System. The “Hardware Management Console” provides advanced virtualisation infrastructure management services such as “Live Partition Mobility”. It is possible to run a budget PowerVM configuration with “Integrated Virtualisation Management” which is a Web-based service on the Virtual I/O Server (no HMC required). IBM SystemsDirector can also be deployed as a “Cloud services” overlay to link multiple HMCs together. PowerVM has no concept of “automated” vSphere HA or DRS. Single or Dual HMCs or IVM only? PowerVM does not have the concept of “VDS”, the closest is “VSS” manually built by hand within each VIO Server and via the HMC. This is the most complicated part of the puzzle, so bear with me. The Virtual I/O Server is responsible for network and storage I/O virtualisation. It uses “Shared Ethernet Adapters” with the VIOS and “Virtual Ethernet Switches” within the ASM to provide network connectivity to Virtual Servers. For Uplink redundancy, Link Aggregation is configured to bind two interfaces into one. Single or Dual VIOS or Dedicated Uplinks to each Virtual Server? Redundant Uplinks (LAG) to each VIOS? PowerVM has a version of “Datastores” which is the Shared Storage Pool, the other alternative is the equivalent of “pRDMs” where a LUN is bound to a Virtual Server. Raw Devices or Shared Storage Pools? If Raw Devices: Dedicated HBAs to Virtual Server? The “vShield” equivalent for PowerVM is PowerSC, otherwise Endpoint security can be implemented with agents from your favourite vendor that supports AIX. There is no “VADP” for PowerVM, so Backup/Recovery is implemented with agents from your favourite vendor that supports AIX. However AIX does have a “NIM” server function that provides image-level backups of AIX. Enable the ASM on each PowerVM “Host”, otherwise it will appear as a “Server” and not a “Host” within the HMC. If you are implementing a large PowerVM farm, then you must have a large budget; especially when you add SystemsDirector, Tivoli, Enterprise licensing and HMC/Frame hardware. Seriously consider using IBM professional services and a Resident Engineer (for first year of operations) to get the job done, it is too complicated to execute and operate on your own.